Fridays/Saturdays at 7:30pm, Sundays at 3:00pm (In cases of sell-outs, additional Matinees on Saturday may be scheduled). NOTE: This play is recommended for all audiences ages 13 and higher. Subject matter may be difficult to keep the attention of patrons below the age listed above. Shakespeare’s Measure for Measure centers on the fate of Claudio, who is arrested by Lord Angelo, the temporary leader of Vienna. Angelo is left in charge by the Duke, who pretends to leave town but instead dresses as a friar to observe the goings‐on in his absence. Angelo is strict, moralistic, and unwavering in his decision‐making; he decides that there is too much freedom in Vienna and takes it upon himself to rid the city of brothels and unlawful sexual activity. Laws against these behaviors and institutions already exist, and Angelo simply decides to enforce them more strictly. Claudio is arrested for impregnating Juliet, his lover, before they were married (an event that is discussed after the fact, but not part of the staged scenes). Claudio is sentenced to death in order to serve as an example to the other citizens, even though the act was consensual. Isabella, Claudio’s sister, is about to enter a nunnery when her brother is arrested. She is unfailingly virtuous, religious, and chaste. When she hears of her brother’s arrest, she goes to Angelo to beg him for mercy. He refuses, but suggests that there might be some way to change his mind. When he propositions her, saying that he will let Claudio live if she agrees to become his mistress. She is shocked and immediately refuses. The Duke later forms a plan by which Isabella will agree to Angelo’s proposition, but then have her saved exposing Angelo’s corruption. The next morning, Angelo will be forced to pardon Claudio. Everything goes according to plan, except that Angelo does not pardon Claudio, fearing revenge. The provost and the Duke send him the head of a dead pirate, claiming that it belonged to Claudio, and Angelo believes that his orders were carried out. Isabella is told that her brother is dead, and that she should submit a complaint to the Duke, who is due to arrive shortly, accusing Angelo of immoral acts. The Duke returns in his usual clothes, saying that he will hear all grievances immediately. Isabella tells her story, and the Duke pretends not to believe her. Eventually, the Duke reveals his dual identity, and everyone is forced to be honest. Angelo confesses to his misdeeds, Claudio is pardoned, and the Duke makes everything right. 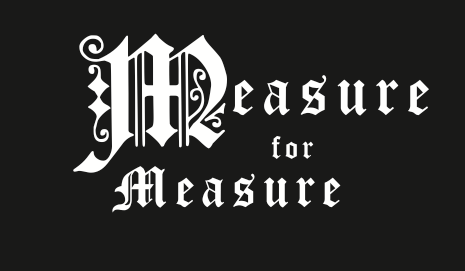 Measure for Measure is a great illustration of an important action in life: Standing up for what is right, even when it’s not the most popular, or safe decision. Check back for tickets towards early February.